In his second-grade Christmas pageant, Greg Trzaskoma was the only kid who didn’t need a microphone. That booming voice and personality would do him well after coming to the conclusion, while selling television sets at Montgomery Ward, that he wanted to be an actor. Perhaps it was because he had found his calling. Trzaskoma took acting classes and won lead roles in Macomb theater department productions of Jesus Christ Superstar (Pontius Pilate) and Grease (Teen Angel). He went on to earn a Bachelor of Arts Degree in Theatre from the University of Detroit (Mercy) and Master of Arts in Theatre from Wayne State University, followed by awards and critics’ praise while performing at the Hilberry Theatre, Jewish Ensemble Theatre, Planet Ant Theatre and other local venues. And, then, there was that gig with the Pistons in the early 2000s. That’s “O” as in the red one Detroit Pistons’ guard Jerry Stackhouse painted on Trzaskoma’s stomach as part of a popular series of television commercials that paired him with local blues legend Thornetta Davis. 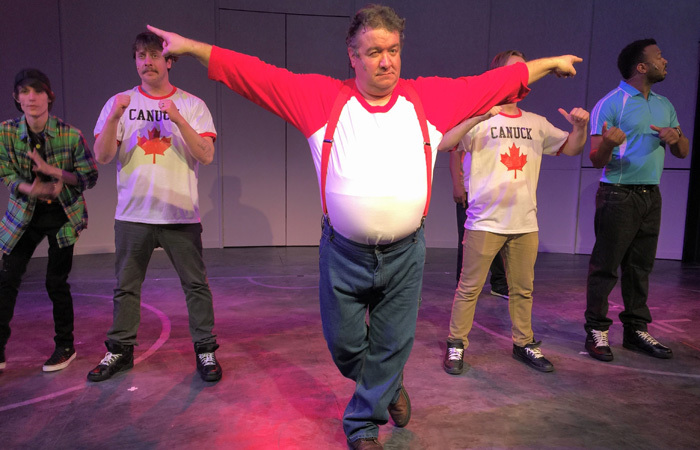 Now, the University of Detroit Mercy and Macomb theater instructor and founder/director of the Warren Civic Theatre is starring in the much heralded Hockey, The Musical!, written by Mitch Albom, Detroit sports-journalist and bestselling author. “He’s very hands-on,” says Trzaskoma of Albom. “His brother, Peter, is directing it but he was in England during the auditions, so Mitch ran auditions here and Peter watched and directed via Skype. Very 21st century. However, Hockey – The Musical!, thinks Trzaskoma, is timeless.